This book provides a comprehensive framework for analysing, comparing and promoting territorial governance in policy relevant research. It reveals in-depth considerations of the emergence, state-of-the art and evolution of the concept of territorial governance. A unique series of ten case studies across Europe, from neighbourhood planning in North Shields in the North East of England to climate change adaptation in the Baltic Sea Region, provides far-reaching insights into a number of key elements of territorial governance. The book draws generalised empirically-based conclusions and discusses modes of transferability of ‘good practices’. A number of suggestions are presented as to how the main findings from this book can inform theories of territorial governance and spatial policy and planning. 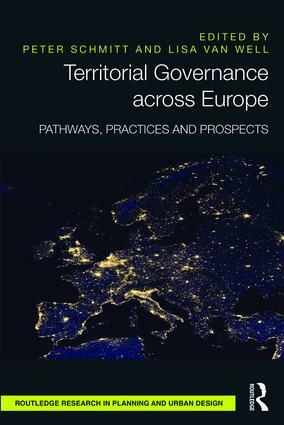 Territorial Governance across Europe will be of considerable interest to scholars around the world who are concerned with European studies, regional policy, urban and regional planning, and human and political geography. It provides a solid debate on discourses, theories, concepts and methods around the notion of territorial governance as well as a number of empirical findings from various contexts across Europe. It specifically targets scholars involved in policy-relevant research. Peter Schmitt is Associate Professor at the Department of Human Geography at Stockholm University and Senior Research Fellow at Nordregio, the Nordic Centre for Spatial Development. He has a PhD in Spatial Planning from Dortmund University. His areas of expertise are in the fields of territorial governance and regional planning. Lisa Van Well is a Senior Researcher at the Swedish Geotechnical Institute. She has a PhD in Regional Planning from KTH, Royal Institute of Technology in Stockholm. Her areas of expertise and publication are in the policy relevant fields of climate change adaptation governance, regional development and European territorial cooperation.